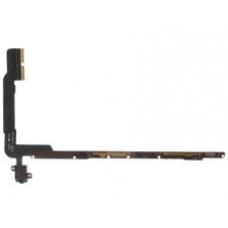 iPad 4 headphone jack socket audio flex cable with circuit board, If your iPad 4 headphones no longer work when plugged into the iPad, odds are your headphone jack socket is faulty. Replacing this part will solve your headphone sound issues. The circuit board is pre-soldered to the headphone jack socket flex cable, so no soldering is required for installation. This genuine Apple spare part is compatible with the Apple iPad 4th generation Wi-Fi model only.